Well, that was one intense weekend. I participated in the Global Game Jam this weekend, together with Emiel Kampen (Prrrpl), Jay van Hutten (JayvanHutten.com) and Rianne Schaekens (RianneSchaekens.nl). The four of us were followed by GameKings (Dutch television), so there will be an article about the whole experience online next week! In 48 hours we created the game S.T.A.R. or Super Turbo Action Rainbows. The Global Game Jam takes place once a year and is an event where you collaborate with other people to create a game in 48 hours! This is of course a very short time to come to a concept and build that game, so it means lot’s of stress and not enough sleep. But at the same time it’s a great way to be with people that have the same passion as you do, go wild on crazy ideas and to have a new game to show in a short time. Emiel and Jay were the game designers and programmers of our team. Rianne is a Communication and Multimedia student, games were quite new to her, but her curiosity drove her to this jam. She helped me with the art, creating the player characters that you can see in the user interface. I created the visual style, interface design, logo’s and the rest of the art. Every year there is a theme and this years theme was ‘What do we do now?’. We created a hectic 4-player local multiplayer game where you needed to bring babies in safety by moving them to a warppoint. For every baby you safe, you get a point, or more, if you’ve held the baby the longest. The tricky part was that you couldn’t do this alone, because you could only move the baby in one way (horizontal or vertically, using a rainbow). 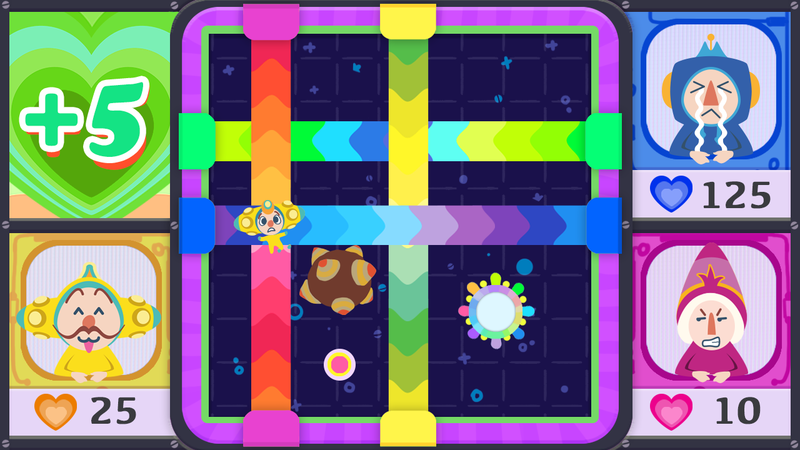 Another player can only move a baby in the other way, so you needed to work together to win points. For the style we chose to go with shapes and bright colors, I did this for two reasons: we needed to work in a style that both Rianne and I could work with and because we only started working on the game the second day, we needed to work with an artstyle that was quick to create. Working only with shapes, no gradients, lights and shadows, means that you don’t need to worry about lines, correct lightning and other time consuming stuff. The style matches a lot with Katamari and Hohokum. We got a honorable mention for it! (Best quirky, colorful and funny art). Vine made by Zo-ii (Zuraida Buter). Here’s a trailer (also made during the 48 hours) of the game and some more art and pictures.